The Teamup team is pleased to bring you an exciting development: user accounts. Anyone can create a Teamup user account. User accounts are optional; all Teamup calendars still function in the same way, whether or not you choose to create a Teamup user account. With a Teamup user account, you have a central place to access all your Teamup calendars. Once you create a user account, you can log in and view your Teamup calendars in your calendar dashboard. 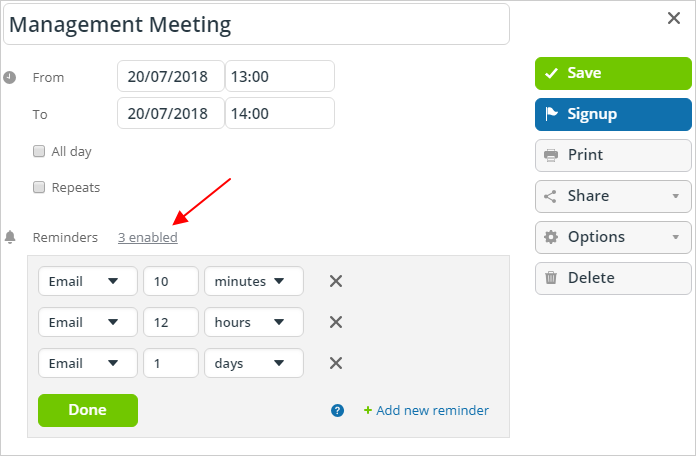 You can also set up and manage event reminders from your user account. The calendar dashboard remembers all your Teamup calendars. You don’t have to bookmark separate calendar links anymore. You can access all your calendars, both those you created and those that have been shared with you, from your dashboard. Log in on any browser, view your dashboard, and click to open the calendar you need to see. Keep all your calendars in your account dashboard for easy access from any browser. Learn more about the calendar dashboard. Reminders of upcoming events have been a long-requested feature for our users. We are thrilled to be able to provide event reminders with your user account. You can set up reminders for a single event, or for all events on a selected sub-calendar. Currently, reminders are delivered by email only. In the future, more delivery options will be added. To use event reminders, first you must be logged into your Teamup user account. You can set up multiple event reminders for a single event or sub-calendar. To set up reminders for a sub-calendar, make sure you are logged into your Teamup account. From your calendar, click on the blue menu in the top right corner; select Preferences > Default Reminders. Click the Edit icon for the desired sub-calendar and add one or multiple reminders for the sub-calendar, then click Save. Learn more about event reminders. Register here to create your Teamup user account. If you have a question that’s not answered here, let us know by emailing support@teamup.com. Q: I requested to reset my password but did not receive any email. What do I do now? It’s most likely that you have not created a Teamup user account. This post describes possible issues with a password reset and how to resolve them. Q: Is my user account password the same as my calendar password? No. Your user account password is only used to login to your user account. Calendar passwords are set up separately. If you are logged into your account and click to open a password-protected calendar, you will still need to enter your calendar password. Learn more. Q: Do I have to have a user account to access my Teamup calendar? No, you do not. All your Teamup calendars are still accessible via calendar link. A user account is an optional way to access Teamup, with extra benefits, but is not required for using Teamup calendars. Learn more. Q: Do other people have to have a user account to access calendars I share with them? No, user accounts are not required to access shared Teamup calendars. To share a Teamup calendar, create a calendar link by going to Settings > Sharing. With that calendar link, others can access your shared Teamup calendar with or without a user account. Learn more. Q: Why don’t I see all my Teamup calendars on my dashboard? 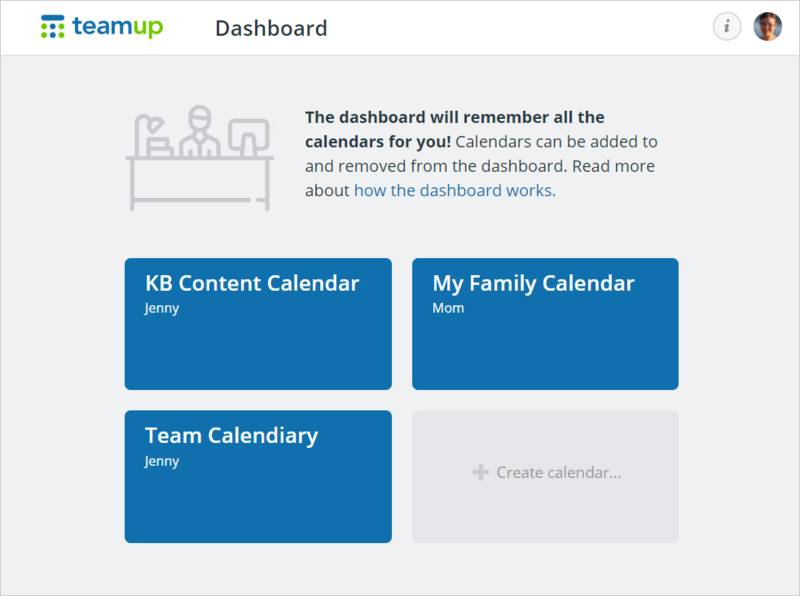 If you haven’t accessed your Teamup calendars while logged into your user account, you may not have added them to your dashboard yet. Learn more. Q: What’s the difference between “logout” and “exit”? The Exit option refers to leaving a password-protected calendar link. Exiting a password-protected link does not log you out of your user account. The Logout option refers to logging out of your user account. Logging out of your user account will cause you to exit the password-protected calendar links you are currently accessing, as well. Learn more. Q: What is the “Applications” option I see in my user account menu? A: The Applications menu item is a placeholder as we work on future features and integrations. You can simply ignore it for now. For more detailed information about user accounts, see this article. Ready to set up your user account? Click here.